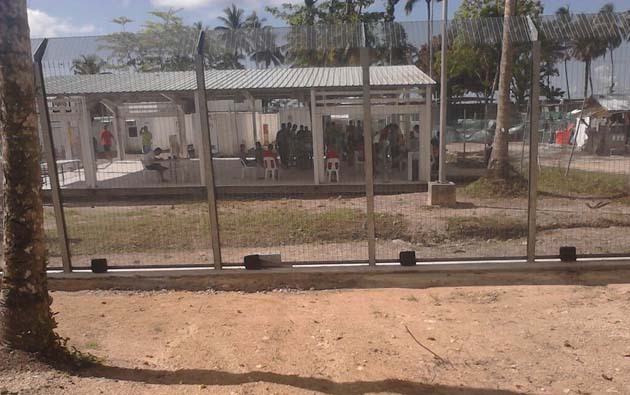 A major constitutional challenge to the Manus Island detention centre, and the violation of the human rights of asylum seekers detained there, is underway in the PNG Supreme Court. Ironically, instructions to take the action against the PNG government came after asylum seekers, who had been taken to jail from the detention centre during January’s hunger strike, managed to get statements smuggled out of the jail. As Solidarity goes to press, PNG lawyer, Ben Lomai, acting initially for 25 asylum seekers, is seeking court orders to allow lawyers’ access to the detention centre to obtain statements, potentially from the asylum seekers. The legal action seeks the release of all asylum seekers and the closure of the detention centre. A previous constitutional challenge by Opposition leader Beldan Nemah stalled over the issue of his “standing” before the court and a relentless bureaucratic effort to frustrate the action. Similarly a PNG National Court inquiry initiated by Justice Canning into the Memorandum of Understanding between Australia and PNG was stuck in legal limbo following the Australian government funding lawyers to subject the inquiry to endless legal manoeuvres. The current legal action has been taken on behalf of asylum seekers themselves to challenge the human rights abuses they have suffered—their initial transfer to PNG, the inhuman conditions, the torture, deprivation of liberty and lack of access to the law. Thirty asylum seekers—supposed ringleaders of the hunger strike—are still under close surveillance in Charlie compound. Statements from asylum seekers beaten and abused during the hunger strike are also being collated to make individual complaints. One Wilson’s security guard is reported to have been sacked following asylum seekers’ complaints of being assaulted on a bus taking them to Lorengau jail when they were rounded up during the hunger strike. Even if the report is true, it is only one among the scores of Wilson’s security guards and PNG police that are guilty of assault, and are yet to be held to account.